Historically, the first historically known mines of chrysoberyl were discovered in the 17th and 18th century in Brazil. Theses mines of Itaguaçu in the states of Espirito Santo and Araçuai in Minas Gerais were the original provenance for this gemstone. A few other stones were also found in the region of Bahia. Chrysoberyl deposits are generally located in granitic pegmatites for primary deposits and in degraded metamorphic rocks for secondary deposits. It is found now in several places in South Africa, mainly near the localities of Daberas, Wolfkop and Leeuwkop in the province of Northern Cape. The district of Letaba, in the province of Limpopo, also produced some specimens. In Namibia, due to chance, it can be found in the practically depleted mines of the Tantalite Valley. 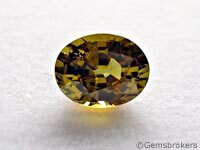 Some chrysoberyl crystals can be found in the United States, principally in the states of Connecticut, Maine, New York and Colorado. In Europe, some stones were extracted in Italy in Piedmont region. In India deposits are located in the southern part of the state of Kerala. In Myanmar, former Burma, chrysoberyls are extracted from the famous mines of Mogok and also from Bago region, formerly Pegu or Hanthawaddy. Sri Lanka always produces some magnificent gems in the region of Ratnapura. Nowadays, the main part of the chrysoberyl production comes from Tanzania in the region of Tunduru and from Madagascar in the district of the Lake Alaotra, near Toamasina (former Tamatave), and recently around the city of Sakkhara in the south of the island.